1. Preheat oven to 425F degrees. Set aside a large baking sheet. If you haven't cooked the bacon already, get it started now. 2. Flour a large work surface and roll out pizza dough to about 18 inches across. Using your finger tips, slide the dough onto the pan. Sprinkle mozzarella cheese on top. 3. In a medium bowl, whisk together eggs and milk. Pour whisked eggs over pizza dough. 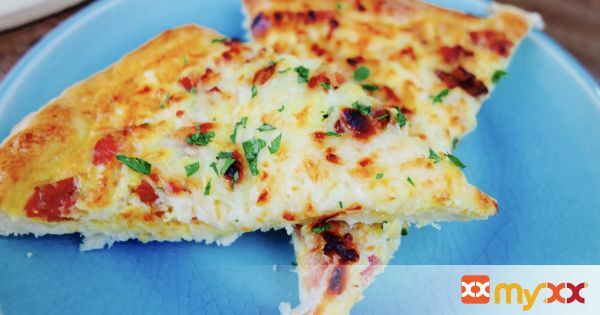 Top the pizza with cooked bacon and cheddar cheese. 4. Bake for 15 minutes in the top half of the oven until the cheese is bubbling. Serve warm with optional sauces. Enjoy!